Chris Canfield has stepped down as Executive Director of Audubon North Carolina to assume the position of Vice President, Gulf of Mexico Conservation and Restoration. Canfield took the helm at Audubon North Carolina in 2000 and during his 10-year tenure the organization has grown in scope and stature to become one of the premier conservation/environmental organizations in the state – its influence reaching from the mountains to the sea. 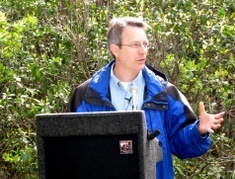 Some of Audubon North Carolina’s accomplishments under Canfield’s watch include spearheading a grassroots coalition to stop the U.S. Navy from building an airfield adjacent to Pocosin Lakes National Wildlife Refuge; working to improve natural resource management at Cape Hatteras National Seashore; implementing a statewide Important Bird Area (IBA) program that includes four million acres at 96 sites across the state and helping, with partners, to establish North Carolina’s Birding Trail that stretches from the Outer Banks, across the Piedmont to the peaks of Western North Carolina. “I’m proud of what we’ve done in North Carolina,” Canfield said. He noted that it was especially rewarding to work with local Audubon chapters, individuals, groups and agencies across the state. Canfield saw North Carolina’s IBA program as a way to assimilate, enhance, expand and incorporate different natural resource goals and land ethics into an over-arching conservation initiative that could simultaneously meet a myriad of ecological and environmental needs. “And I believe it’s as good a model as any out there,” he said. VP, Gulf of Mexico Conservation and Restoration was not on any Audubon job board and Canfield did not apply for the position. “At the [Audubon NC] annual meeting in Highlands, I spoke from my heart about the oil spill and the environmental impacts along the Gulf Coast,” Canfield said. “Next thing I know, I got a call from Audubon headquarters in New York saying we want you to coordinate the work going on in the Gulf. “It threw me, at first. I thought, uh-oh, the universe is calling my bluff. But,” he said, “I have Tabasco in my soul,” referring to the fact that he was born in Baton Rouge and spent the first 20 years of his life in Louisiana and south Alabama. The position is a work in progress. “There’s a lot, yet, to be figured out,” Canfield said. “There’s a lot of great work going on along the Gulf from Texas to Florida and it’ll be my job to codify and coordinate all these parts to create an in-depth program to benefit the entire region. Canfield said that BP should step up and do more to assist in restoration in the Gulf. He said it would be part of his job to figure out how to work with the myriad oil and energy companies that are as much a part of the gumbo of Gulf coastal life as the marshes and estuaries they drill in. “We know we can do it better,” he said. My North Carolina mountain heart will miss Chris but the Tabasco in my Louisiana soul welcomes him home.